“Penny is an excellent musician and patient teacher who responds to the needs of her students whether it be an eight-year or, as in my case, an 85 year old. I started playing the violin in grade school and more or less continued until I was in my second year of High School, at which point I decided I was too busy. It was not until approximately a year ago that decided that I would like to start playing again. I still had my old violin, had it repaired and purchased several beginning self-teaching books, which I went through and fairly quickly realized I needed a teacher. "In case there was any question about whether N____ liked his violin lesson today, he has been "practicing" all night (rest position, playing position, slow song, fast song, take a bow). After a while I realized it was pretty quiet, and I found him asleep on our living room floor!" 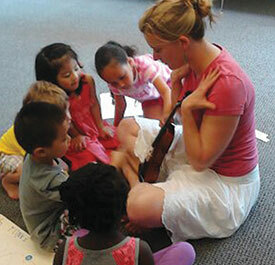 “My two kids have loved their weekly violin classes. We especially liked the easygoing and fun atmosphere of Madalyne's class. "Our family thinks the world of Sheryl! She has wonderful patience, ways of eliciting enthusiasm from students, and solid musicianship. Our daughter was able to progress at just the right pace, developing skills for and confidence in performance." "The group teacher you have was fantastically engaging. As for my son, he just loves that violin! It is such a jot to watch a true love for skill in playing music develop in the hearts of young children,. For that, I thank you! Wayland School of Music flows through our family and it is brining overflowing joy to people everywhere he plays. Now his sister is inspired!" “Madalyne is a treasure - she is truly a wonderful teacher. Somehow my son managed to find the wherewithal to practice violin even when he was miserable -- because Madalyne somehow makes things all seem so do-able and even fun. That is a miracle! "Madalyne is really fun and funny and she is a great teacher!"